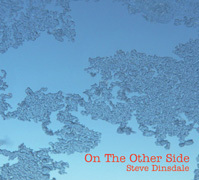 On the Other Side (47'46") is (among other things) a tribute to the single-mindedness of the solo artist. 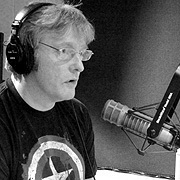 Although Steve Dinsdale continues to be a significant part of Radio Massacre International, his artistic vision must disappear against the immensity of the trio's dense free-form concept. With this, his second solo CD, Dinsdale probes deeper into his own ideas about music and sound. His determination to be a part of something creative every single day is Dinsdale's ideal and his audience's delight - as this CD is the result of many a day's creative encounter with music. We hear a mood of celebration in these tracks, along with a healthy dose of 1970s German Space Rock. With Dinsdale playing drums and percussives beneath cycling sequencer patterns and lilting synth melodies, the first few tracks from On the Other Side gently propels the album through the Prog era and on into the 21st century. These pieces are tightly arranged and unfold in a friendly way out into the listening space. The last four of the eight tracks make up the title work, and an interesting suite of music it is. Dinsdale does give this collage continuity, yet the music remains open and spacious. More atmospheric and textural than the previous songs, this area and its easy kinetic flow engage the listener with dancing arpeggios, breathy chorus, ethereal flutes, synth strings and a pleasing melodic confluence. On the Other Side will seem familiar, but not at all derivative. It is nothing less than a true expression of Dinsdale's being - which means that this music was not learned, it was lived.